I am so excited to be back and joining in for What I Ate Wednesday for the first time in a LONG time. Hope I can remember how this works! Be sure to check out all of the food fun cooked up by Jenn at Peas And Crayons. Hope I can remember how to link-up! I suppose it should have been the least of my worries, but I was very concerned about what I would get to eat when I was in the hospital. As a vegetarian, that was a valid concern. I envisioned eggs for three meals a day. That actually would have been fine with me. I know that the grilled cheese sandwich they gave me for dinner the day of surgery was like a gourmet meal…I was so hungry. That set the tone for me and when I saw the list of things available for me to choose from, I was impressed and excited. There were many choices and I enjoyed them but sadly, due to my body’s dislike for pain medication, the first two days were kind of a blur. I did eventually remember that this would make a good WIAW post and took two pictures. 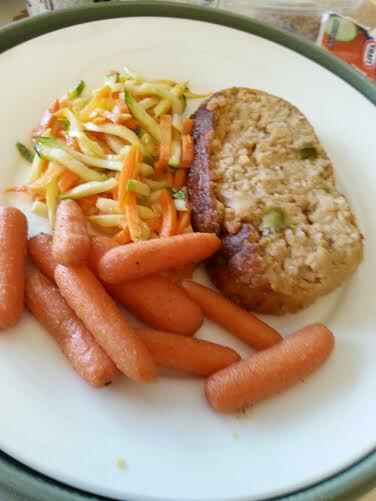 This was vegan meatloaf with carrots and sautéed veggies. It was really very tasty. I would have enjoyed it more if I had remembered to request some ketchup, but it was good. Breakfasts were usually a cheese omelette and yogurt which was good every time. A little blurry, but as I’ve said, I was a little blurry for the first few days. This was Sweet Potato Shepherd’s Pie. It was a vegan meatloaf base with sweet potatoes on top. 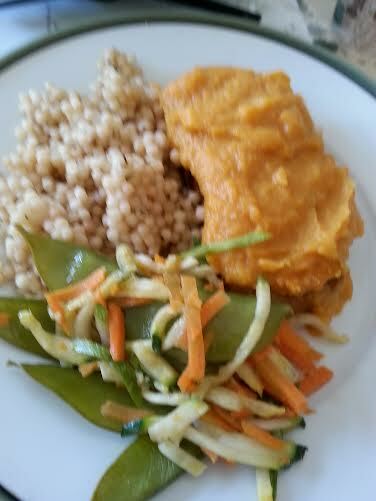 Served with couscous and sautéed veggies. I loved it! There were many other choices which sounded good, but I went with the ones that sounded a little more out of the ordinary. I guess that I should mention that the hospital was Thomas Jefferson University Hospital in Philadelphia. It was a wonderful place and they took exceptional care of me. As I said, not the least of which was offering me things that I could eat! That’s it for me. I’ll be short for my first WIAW back in action. Be sure to check out all the fun over at Jenn’s blog, Peas and Crayons. I’m so happy to be back!